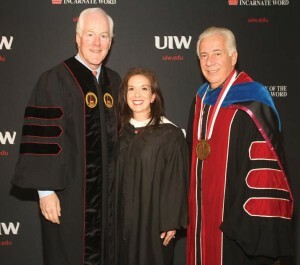 (Pictured L-R) Cornyn, Davila-Burnett, and Dr. Louis Agnese, UIW president, share a photo at spring commencement. 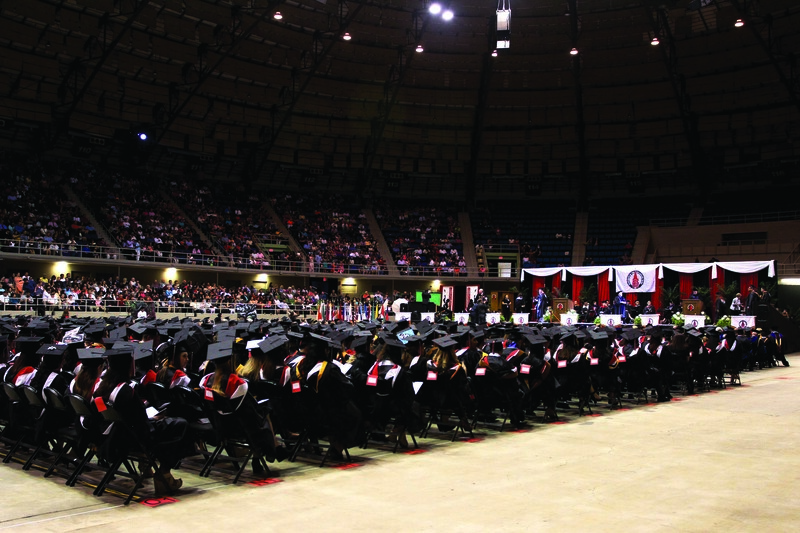 The University of the Incarnate Word (UIW) conferred degrees to over 1000 graduates at four spring commencement ceremonies. The commencement schedule included ceremonies for the Feik School of Pharmacy (FSOP) on May 8, the Rosenberg School of Optometry (RSO) and School of Physical Therapy (SoPT) on May 9, held at the Alice P. McDermott Convocation Center, as well as an undergraduate, graduate and Ph.D. commencement held on May 9 at the Joe & Harry Freeman Coliseum. The SoPT graduated its first cohort of 50 students in the entry-level Doctor of Physical Therapy (DPT) program, as well as nine students of the online post-professional DPT program. Physical therapists are primary health care experts in the movement and function of the human body. The SoPT follows the long tradition of health care excellence at UIW and is one of only two Doctor of Physical Therapy (DPT) programs offered in a Catholic institution in the southern tier of the United States. The weekend’s final commencement ceremony honored students earning their bachelor’s, master’s and doctoral degrees. This year’s commencement speaker was U.S. Senator John Cornyn. A native of San Antonio, Cornyn is serving his third term representing Texas in the U.S. Senate. Prior to his election to the Senate, Cornyn served as Bexar County district judge, a member of the Texas Supreme Court, and as Texas Attorney General. Cornyn has distinguished himself as a leader in the Senate on a variety of issues important to Texans and is a strong supporter of higher education. The 2015 Alumna of Distinction for Service in Mission is Jessica Davila-Burnett. She holds an associate degree from Del Mar College, a bachelor’s from UIW’s Adult Degree Completion Program (ADCaP) at Del Mar College as well as a master’s degree in organizational development from UIW Online. Burnett has been recognized locally, nationally and internationally for her achievements in community service. She was named among the Top 10 Most Amazing Women in the 2004 September Issue of Latina Magazine. She received the 2004 KRIS-TV 6 and Corpus Christi Caller-Times Jefferson Medallion Award, and the 2004 Campus Ministry Award from UIW for outstanding community service. She was named the 2007 Corpus Christi “Under Forty” Person of the Year.